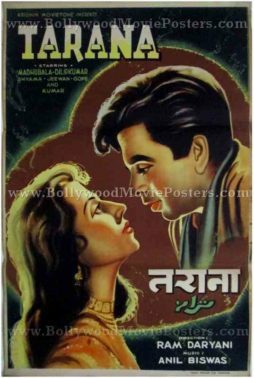 Vintage Bollywood poster for sale of the hit Hindi film Tarana (1951). 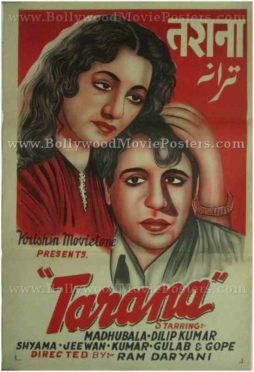 This is an actual surviving vintage Bollywood poster for sale of the 1951 film Tarana which starred the ultimate method actor in Bollywood, Dilip Kumar in the lead role opposite the “Marilyn Monroe of Bollywood,” Madhubala. Tarana was the first film to star superstars Dilip Kumar and Madhubala together, making this vintage Bollywood poster highly collectible! 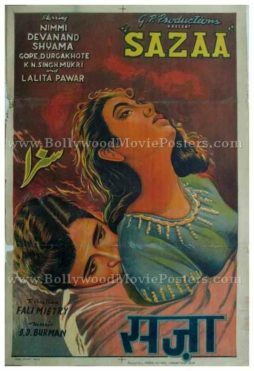 Printed and circulated a few years after the original first release of the film (somewhere in the 1950s), this vintage Bollywood movie poster for sale was printed for publicity of the film but never ended up being used. This vintage Bollywood poster for sale was originally designed in hand painted oil on canvas format by a small time art studio in Kolkata, making it highly collectible. Quirky hand drawn portraits of the lead couple Dilip Kumar and Madhubala are seen in a romantic pose. The use of red and gray color tones gives this Bollywood movie poster a beautiful vintage feel. As was the norm with localized posters of the era, this vintage Bollywood poster for sale has been designed and printed using only two colors (understandably to save on design and print costs). The film is remembered for its music composed by the pioneer of Indian orchestra music in Hindi cinema, Anil Biswas. Tracks like the popular duet sung by Talat Mehmood and Lata Mangeshkar, “Seene Mein Sulagte Hain Armaan” are fondly remembered and played till today.